Service design is allegedly a human-centered method for developing new services. A great effort is made for capturing users’ needs, mental models, experiences, desired outcomes… —you name it! Although this is done specifically borrowing techniques from ethnography, there’s barely no mention to cultural differences! With increasingly global companies, rising migration rates or whole sectors —such as tourism— based on making customers experiencing other countries, isn’t it time to deeply embed cross-cultural issues in service design? Yes! That was my initial motivation to enroll the Cross-cultural issues in service development course. I couldn’t believe such an amazing topic was included in our Service Innovation and Design MBA. Nevertheless, my view was very narrow. I came to the class just thinking: “research the culture, pass the knowledge to the rest of the design team and build a great service. That’s it!”. Of course, that wasn’t just it. And I had to learn much more. Gain a broader view. Discover there’re theoretical frameworks that help you understand cultures. Suffer some cross-cultural issues myself while doing the cross-cultural assignments with a multi-cultural team… And only then, by the end of our term, with the help of my Chinese, Norwegian and Sudanese classmates, while attempting to solve a service challenge for the Finnish tax agency involving Estonian, Russian and Polish construction workers… —OK, this sounds totally like a joke by now— then I started to grasp how and when can you involve culture in service design! But let’s start with the view broadening! What do you mean by culture, anyway? the beliefs, customs, arts, etc., of a particular society, group, place, or time. But there’s one thing interesting in the Merriam Webster’s definitions: they don’t attribute culture to just nations or ethnic groups. They include other groups to which we can belong, time and organizations. And that’s true: our personal culture is shaped by many other factors apart from our nationality. Our particular family, our education, our professional background, our place of work, our age range… All of those and many more other factors overlap —as layers of culture— and make us quite unique. Factors that shape personal culture; please note that this is just the way I picture cultural layers in my head, not a scientific view here! So, first thing you have to bear in mind when approaching cross-cultural issues is that they are not referred only to national or ethic cultures. Misunderstandings and difficulties in people’s interaction caused by cultural differences can come from many other factors that have shaped their culture. “So, what?”, you may be thinking. Well, the practical implication is that basing your reasoning, behavior —or service— on stereotypes or generalizations —even if grounded in solid theory— can lead to unexpected and undesired results. After all, we’re individuals. And respond to things in a personal way. So, don’t take cultural theories too rigidly. Prepare to respond individually. Simply listen to the person you have in front. And be flexible. First broadening: always remember that culture is not only referred to nationality or ethic group. Beware of generalizations. Until now, whenever I went into a new culture —business, country…— I’ve been used to observing first and acting later: trying to understand how people are behaving, what they consider normal, what kind of language they use… and being aware of my own behavior and reactions to it, explaining why I do things if people around seem shocked. This is quite common sense, I guess. And respectful. But a little limited. It takes a long time to be familiar enough with the new culture and it limits your scope to cultures you’re really familiar with. Plus, this knowledge is always subjective and intuitive, difficult to pass on to others. So, if you want to overcome this limitations, there’s something you need to be aware of right now: cultural theories. They’re structured and scientific approaches to understanding different cultures, comparing them and predicting people’s preferences and behaviors according to a few traits or dimensions. Geert Hofstede’s 6 dimensions model. Richard Lewis’ model of culture. 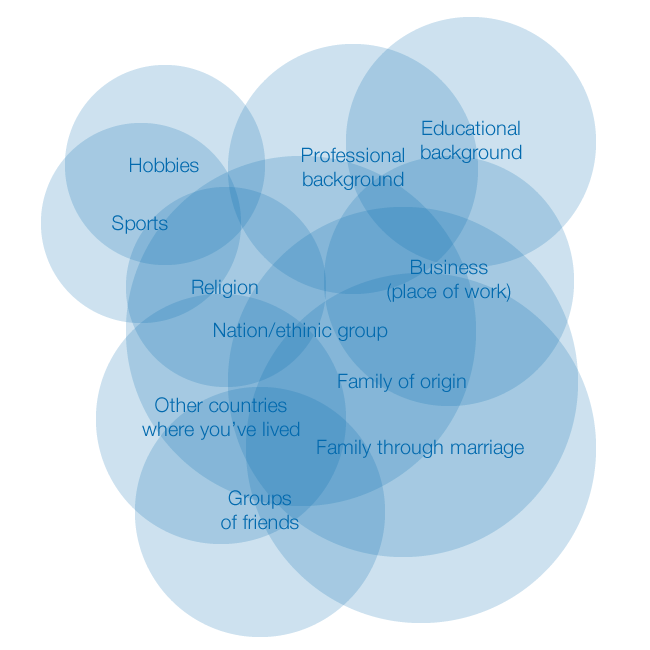 Hofstede’s is one of the most widely used theories of culture. It was first presented in 1980 and was based on a large survey made by thousands of IBM employees around the world. Initially it comprised four dimensions of national culture —relative values that distinguish country cultures from each other— and it’s been updated to six through subsequent studies based on research by other authors and World Values Survey data (1991 and 2010). Power Distance (high versus low): how the less powerful members of society accept power unequality. Uncertainty Avoidance (high versus low): how threatened people feel by uncertainty and ambiguity and try to avoid them. Individualism (Individualist versus Collectivist): whether people look after themselves and their immediate family only or belong to groups who look after them in exchange for loyalty. Pragmatism (Pragmatic versus Normative): whether people behave in a pragmatic or future-oriented way rather than adopting a normative or short-term point of view. Masculinity (high versus low): whether the dominant values in society are achievement and success or caring for others and quality of life. Indulgence (Indulgence versus Restraint): how much people try to control their desires and impulses. 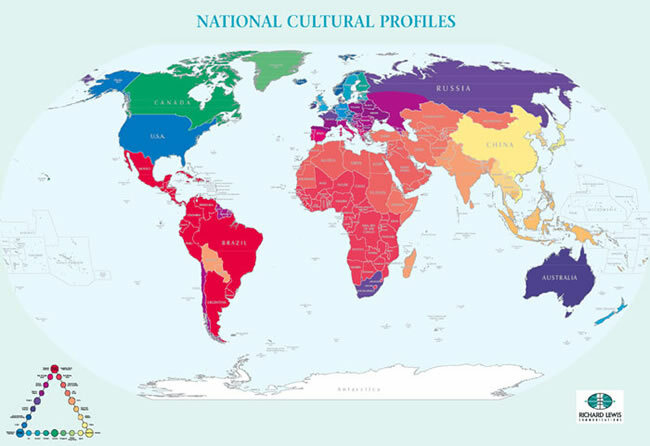 The culture dimensions are used to compare countries through a scoring in a two-end scale on which each country is relatively placed. 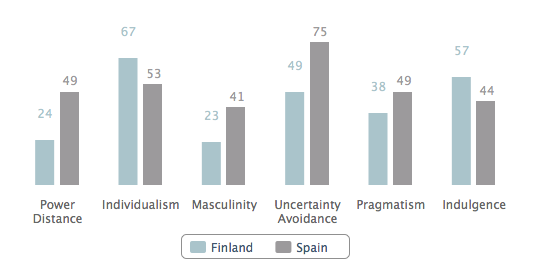 In Hofstede’s website you can find scores for 76 countries and regions. And you can even compare up to three at a time at their country comparison page. Multi-active: people from multi-active cultures value most family, hierarchy, relationships, emotions, eloquence, persuasion and loyalty. In terms of social and business behavior patterns, they tend to talk most of the time, do several things at once, plan grand outline only, show emotions and feelings, confront emotionally, provide good excuses, interrupt often, be people-oriented, put feelings before facts and have a flexible notion of truth. Linear-active: basic values of people from linear-active cultures are facts, planning, products, time-lines, institutions and law. They translate into talking half of the time, doing one thing at a time, planning ahead step-by-step, being polite but direct, concealing feelings, confronting with logic, disliking to lose their face, rarely interrupting, being job-oriented and preferring truth before diplomacy. Reactive: main characteristics of reactive people are intuition, courtesy, networks, common duties, collective harmony and the protection of everyone’s face. Those values imply an extremely polite social and business behavior where people listen most of the time, react to other’s actions, look at general principles, are polite and indirect, conceal their feelings, never confront each other, must not loose their face, don’t interrupt, are very people-oriented, consider statements as promises and put diplomacy before truth. 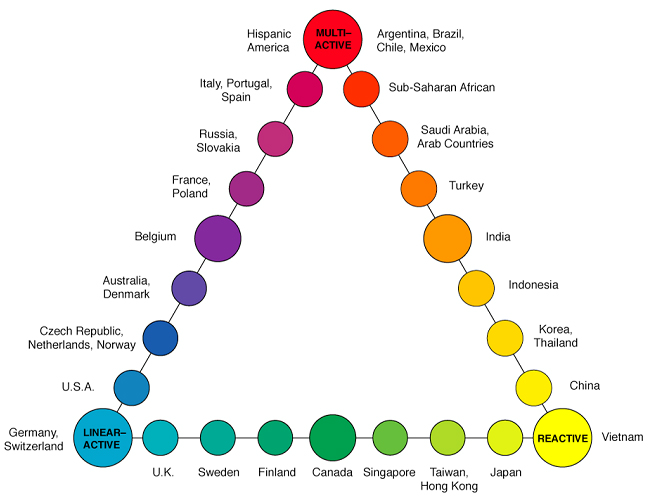 According to the Lewis model, each country has a cultural profile, that either fits perfectly into one of the three categories or lies at some point between two of them. If you want to know more about Lewis model, take a look at their interactive presentation of the model. Second broadening: there’re theories that can help you gain some basic insight about cultures and a framework for interaction across cultures. Third broadening: those theories not only provide you with a theoretical base —dimensions o categories— for reflecting about cultures. They are based on data and can give you concrete scores with which you can compare cultures. You no longer depend solely on your subjective and intuitive grasp. So, how do those theories relate to service? In the cross-cultural issues course, we have use the gaps model developed by Zeithaml, Parasuraman and Berry in 1990 as a basis for understanding service and framing the several cross-cultural issues that can affect providing and receiving service. Set appropriate service designs and standards that match customer expectations. Customer gap: occurs when the perceived service —subjective assessment of the service experience— does not match the customer’s expectations —reference points that the customer brings to the service experience. Provider gaps 1-4: are the underlying causes for the customer gap and happen within the provider organisation. 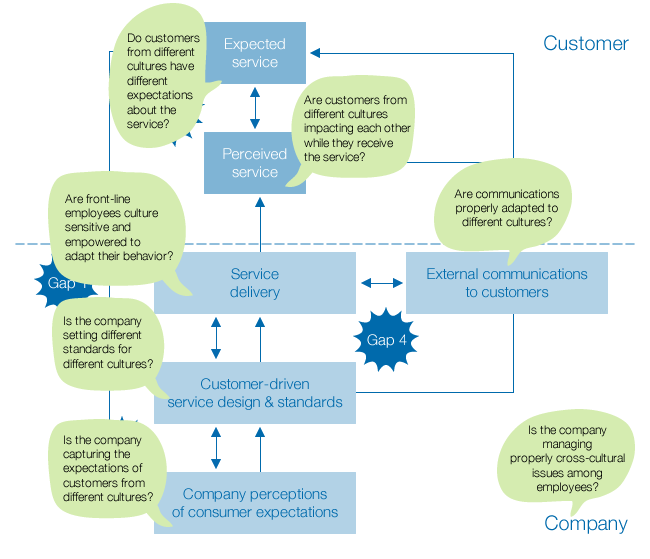 Gap 1 occurs when the organisation does not know what customers expect. Gap 2 occurs when the wrong service designs and standards are selected. 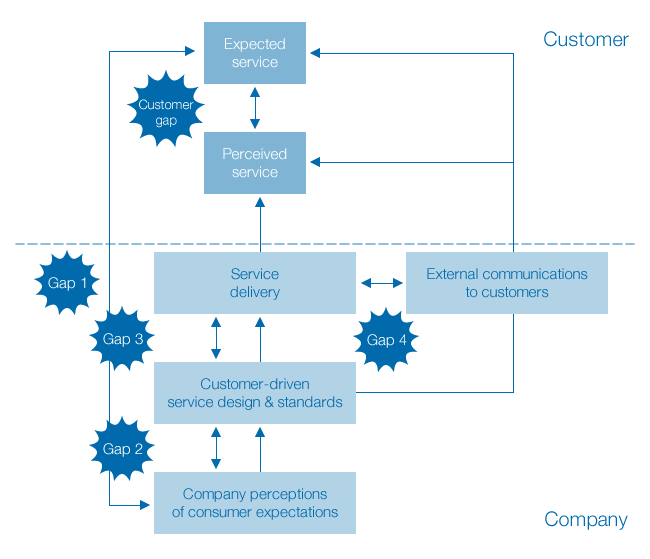 Gap 3 occurs when employees do not deliver service designs and standards. Gap 4 occurs when service performance does not correspond to service promises. If you are wondering what parts of the service can be impacted by cultural differences, what gaps can be affected… Let me show you: all and more! Here are some of the questions we’ve been asking and trying to answer during the cross-cultural issues course. Forth broadening: service is more than service design. Even more than service design and service research together. Many issues relate to the provision of the service itself and the internal relationships amongst employees… Issues also arise when customers form different cultures receive one same service. They impact each other while they receive it. And they can have very distinct expectations, sometimes difficult to combine! But… can you use all this for designing better services? How? Certainly you can. Actually we did a pretty realistic practice of it. But I’m not going to say it’s easy! In my team, we started by selecting a model for the process of service design. 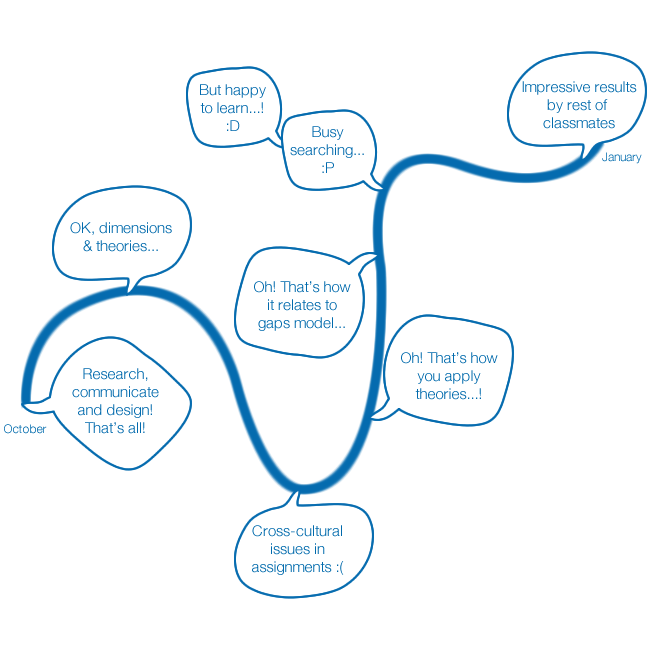 In this particular case, we used the design thinking process model of the Austin Center for Design. In this model, we set when would be the most appropriate phase to introduce cultural issues. Note that before introducing culture information into the process, we used the gaps model right at the start, to frame the problem we were solving. We considered cultural theories as part of the secondary research. Once we had gone through our theory of choice, we did some primary research as well. This way, when we synthesized our findings, cultural insights were embedded and shaped our ideation. Our assignment finished there. But it was clear to us all that specific testing of the results with people from the different cultures was a must. And previous co-creation of the solution with communities of the different cultures was also very advisable. 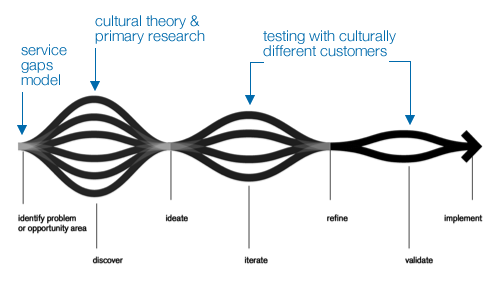 Cultural theories are a great tool for secondary research during service design processes. Additional primary research can help overcome the stereotypes, fill the scoring with some real stories and gain deeper knowledge. It’s always important to remember that people have their own individual layers of culture. And will not exactly fit theories about national cultures or expectation based on stereotypes or even previous personal experience. Service design is only a part of the activities necessary to provide a service. And many more cultural issues arise in the rest of the activities. Providing flexible standards and empowering front-line employees to develop culture sensitivity and react to different situations accordingly is fundamental. That’s all from me. If you want to learn more… you’ll have to take the course yourself! Great post Itziar! Very enlighting and interesting. Congrat, very nice post, very professional….